Tectonic shifts are underway across process industries that will change and alter the way customers function in the future. Spurred by the need to balance innovation, costs, profitability, operational performance, customer centricity and safety, organizations are striving to transform their enterprises, while maintaining a competitive edge. One of the strategic leaders embraced by leading companies across the industry spectrum is that of digital transformation. The process industry sees digital transformation as a key organizational strategy to deploy sustainable innovation across value-chains through the judicious use of digital technologies, while structurally altering operational models, culture and best-practices to encompass new ways of working. While organizations see digital transformation as a pivot point to overhaul enterprise operations, there is a lack of congruence on its value, returns and domains it will impact. The largest disconnect for enterprises is the severe lack in quality available data. The data, comes in many forms, but is not consciously or continuously leveraged by most companies to drive sustained value-creation. In line with this market requirement, Yokogawa announced Synaptic Business AutomationTM in 2017. The value of Synaptic Business Automation is in creating profitable and sustainable growth for customers through coinnovation and collaboration across three potential improvement areas – resilient operation, optimized production and business innovation. Our vision at Yokogawa is to continue to progress and, expand the Synaptic Business Automation's solution portfolio tied to each of the three aforementioned improvement areas. Process industries are facing a disrupt-transform cycle that is fundamentally going to transform the way value chains behave in future. The industry is also looking to manage conflicting priorities like maximizing flexibility, modernizing processes, minimizing product quality variability, enabling a safe, secure operation while effectively driving innovation and customer centricity. Further, the use of legacy technology assets and operational models are not built to help customers solve present-day and emerging challenges. This is steering the industry to embrace digitization, digitalization and ultimately vector towards digital transformation (please see definitions as part of Exhibit 2 below ). • Stage 1: Digitization – is the adoption of digital technologies (e.g., wireless, smart devices, edge, analytics/algorithms, controls, software and cybersecurity) to drive automation, repeatability and predictability in actions compared to traditional work processes. 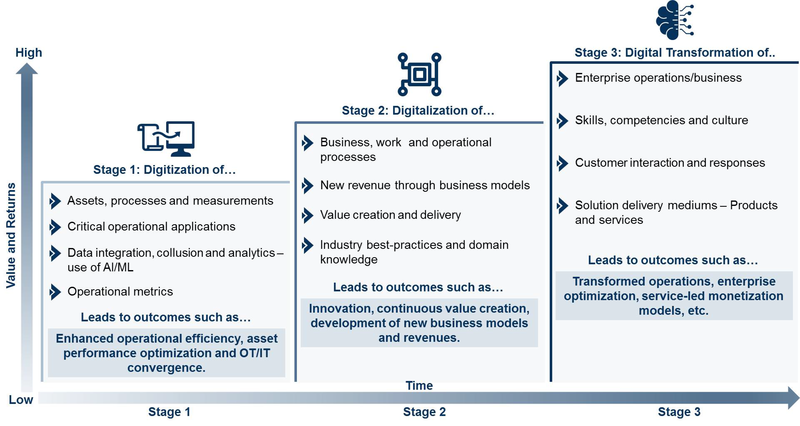 • Stage 2: Digitalization – leverages digitized data collected to drive new revenue streams, valuecreation while transforming business, work and operational processes. Additionally, this includes helping customers benchmark their performance against industry best-practices that are constantly reviewed. This is a step-change in processes, as customers are used to comparing performance against historical set point data. New business models, alternate monetization (such as outcomes-based services) will be generated as a result of this stage. • Stage 3: Digital Transformation – builds on digitization and digitalization to transform enterprise operations. Stage 1 and 2 may be restricted to individual sites/plants, while moving into Stage 3 helps customers to drive performance excellence across the enterprise. This transformation should be done with world leading technical expertise within a structured change management process so that your outcome is you become a world class performer and that performance is sustained. While this is an internal benefit, digital transformation will also help companies interact in new ways with customers and create truly digital offerings. Further, when moving into this stage, Frost & Sullivan expects that organizations will re-discover their fundamental vision and transform into completely re-defined organizations. For example: Many automotive companies were in the business of producing, selling and maintaining cars as their main product. However, today – with digitization, digitalization and digital transformation, car companies are realizing that they are in the ‘mobility platform’ business. Mobility platform business is an emerging market where solution providers offer multiple forms of mobility (car, bike, public transport access, rentals, self-driving cars, etc.) using a mashup of services and partnerships with various independent service providers including finance, shared ownership, maintenance and emergency support. As new personal mobility space evolves, customers need for multi-modal transportation; shifts in car ownership models, self-driving cars and the growth of electric vehicles would ultimately fasten the adoption of this change. Data is siloed, dark and lacks governance: Frost & Sullivan estimates that process industries utilize less than 5% of the data that is collected. 95% of the data is siloed (used selectively), dark (unused data) and lacks consistency in use. Weak data structures, integrity and reliability: As the industry matures itself over data utilization, there is a growing lack of data structure or ‘date models’ which restraints scalability and extensibility of its usefulness. Further, the quality of data is dependent upon the assets/devices functionality. For example: A pH sensor that is not calibrated properly will result in data that is not true to its operational performance. Hence, collecting data from these sensors to check its trueness in measurements is very critical. Unlike measurement of the parameters, this further compounds the problem, as the base data is utilized to drive insights and outcomes. 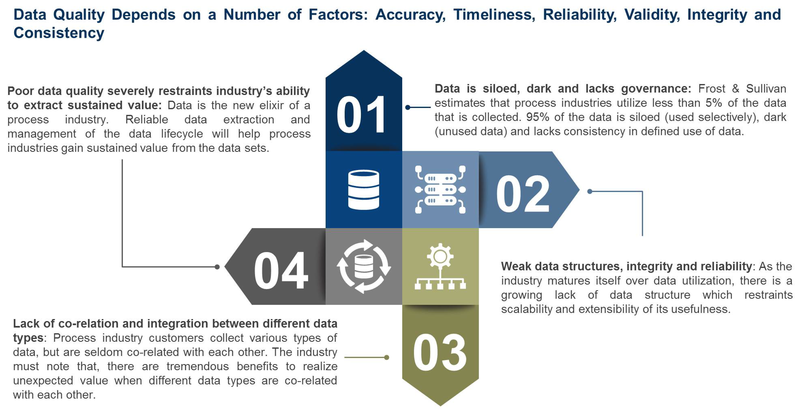 Lack of co-relation and integration between different data types: Process industry customers collect various types of data, but these are seldom co-related with each other in an appropriate context. The industry must note that, there are tremendous benefits to realize unexpected value when different data types are co-related with each other. For example: When pressure data is co-related with vibration and flow data, we can reasonably assess the level of corrosion in pipes and assets. Poor data quality severely restraints industry’s ability to extract sustained value: Data is the new elixir of a process industry. Reliable data extraction and management of the data lifecycle will help process industries gain sustained value from the data sets and a competitive edge. Data, unlike other metrics, does not get old and is always extensible across a multitude of applications. In essence – to achieve digital transformation, data quality is important which relies on factors such as accuracy, timeliness, reliability, validity, integrity and consistency is highly important. Poor data quality drives the cost of poor quality as well. For example: if data is extracted from a sensor that is not calibrated, all downstream processes and analytics would be affected. In order to attack at source, it is important for industries to realize the need to maintain, manage and sustain improvements in data quality. Thus, meaningful, co-related and reliable data is the foundation to digital transformation. While there are many definitions for digital transformation, we believe in what it enables a customer to achieve as core outcomes. As shown in Exhibit 4, it is entirely about leveraging digital technologies to operate and generate revenues across the customer’s value-stream. As you see above, the value of data is fundamentally intrinsic to help a customer in their ability to predict, prevent and prescribe insights for smarter, faster, leaner and profitable operations. This will be made possible as investments in digitization, digitalization and digital transformation is inevitable. However, in today's scenario, process industry customers feel the general sense of incongruity on whether the value created by digital transformation will outweigh the CAPEX outlay. The pioneers (who are in Stage 3, as per Exhibit 2) have already begun to adopt digital technologies and are embracing digital transformation. 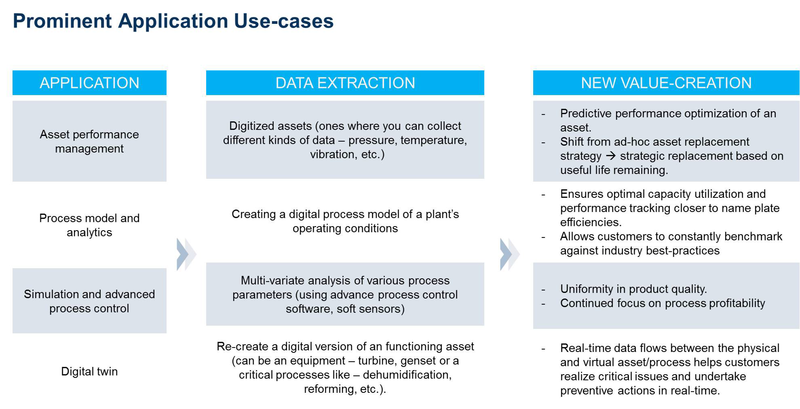 Let's look at specific use-cases on how Yokogawa has helped customers in their digital journey as shown below in Exhibit 6. Immaterial of the organization size (large, medium and small) or of the industry type – as seen above, digital transformation has its benefits and will definitely pay back in the long run. However, the challenge for organizations is in identifying critical application areas, collecting meaningful data and performing intelligent analytics to drive decision making focused on profitability. There is a widening divide in today’s plants due to rising technological complexity and growing depletion of the skilled workforce. 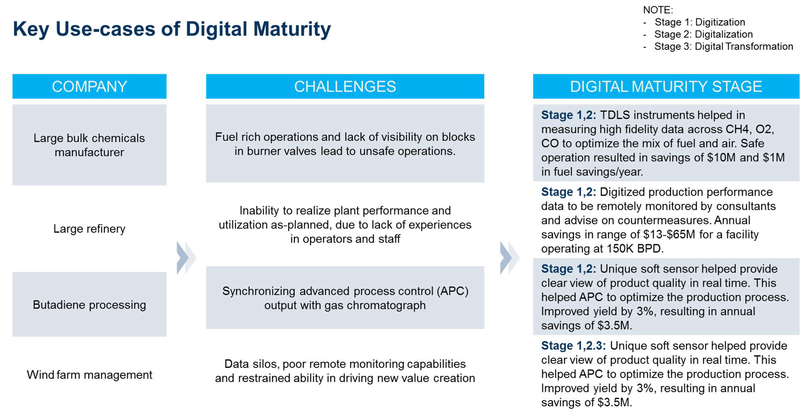 Compounding this challenge is the entry of digital natives into process industry operations management. The millennial mindset is driving organizations to re-think the applications, tools, and technology used to modernize the operations landscape in order to make it more user-friendly and intuitive. In the following chapter, we will uncover the drawbacks of traditional market approaches to structuring OpreX Profit-driven Operation and Yokogawa’s differentiated market positioning in the same. Beginning two years back, Yokogawa observed the strategic need to expand its portfolio and become　more customer-centric in its solutions and service approach. It recognized the need for expertise-as-aservice in the market and acquired KBC Advanced Technologies, Industrial Knowledge and SOTEICA VISUAL MESA. Yokogawa has made a number of strategic acquisitions and organic developments, lead us to create a differentiated value-proposition – Continuous value creation cycle. This methodology helps customers in minimizing expenditures, risk and rapidly implementation solutions. Another intrinsic part of this cycle is that of process and domain knowledge. This is critical because of the need to understand your plant, its processes in order to efficiently design and deploy customized solutions. Shown below in the Exhibit 7 are the key solutions that enable the continuous value creation cycle. This value creation cycle positions Yokogawa as a reliable and trusted partner for challenges within the four walls of the plant and beyond, including the supply-chain network. 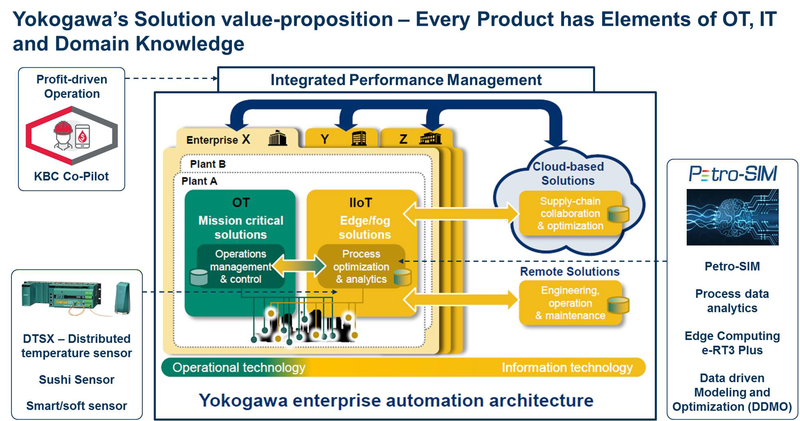 The key aspect to note here is Yokogawa’s ability to not only provide offerings related to conventional automation and applications, but also deliver comprehensive solutions from sensors to enterprise, to total plant, and advanced deployment models such as cloud and remote solutions. Create & Implement: Deals with the design and deployment of optimal solutions at a customer's site, based on the potential areas of improvement outlined in the ‘Identify’ phase. −Agile project execution: It is an alarming trend that, a significant portion of automation projects have faced schedule delays, scope creep, ineffective change management procedures, etc. While automation is a small part of the overall project, it is a significant lever to drive performance excellence with early engagement. Yokogawa's agile project execution methodology helps in delivering cost-efficient execution, effective management of change, with at least 10% reduction in engineering hours and an overall risk reduction in plant start-up. Operate: This phase deals with either helping the customer or having Yokogawa perform safe and stable operations across the customer’s facilities. −Supply-chain solution: SOTEICA VISUAL MESA (A Yokogawa company and a part of KBC) provides supply chain scheduling production accounting and loss detection solutions. A combination of these solutions with KBC's refinery optimization solutions and supply-chain consulting services provides a comprehensive optimization platform for the hydrocarbon processing industries that can be deployed on premise or via the Cloud. Sustain & Improve: This is a very important phase, wherein Yokogawa maintains the solutions, helping the customer to drive continuous improvement and sustained performance excellence. −KBC Co-PilotTM: Like the Co-Pilot in an aircraft, KBC Co-Pilot is a solution developed to remotely support the plant's operational personnel with expertise and insight. The main objective of the solution is to ensure that the plant always achieves its full operational potential. Yokogawa uses a best-in-class process simulator and plant operating model within the historian, on the cloud, to synchronize with actual operation. The ability to extract real-time plant data helps to compare planned value, optimized value and actual value in real time. Further, with the support of KBC consultants and experts who have diversified knowledge and are powered by the remote connection to the client operations, customers can achieve optimized processes, higher value yields, improved plant reliability and optimized operating costs. Yokogawa have implemented such solutions in the refining industry and plan to extend it to petrochemical and chemical industries. While these solutions, as part of the continuous value-creation cycle have resonated well with our customers, we felt the need to sustainably improve our solutions approach to resolve your emerging challenges and pain points. This led us to the development of another key solution - OpreX Profit-driven Operation. This solution is very unique as it helps customers leverage us to design performance indicators that are specific to you and helps in close tracking to them. The OpreX Profit-driven Operation solution is defined as an integrated solution for process industries that delivers seamless alignment with plant management objectives between the C-suite, engineering and operations. The solution is centered around a unique framework of co-related indicators distilled from Yokogawa’s extensive domain knowledge. Critical issue 1: C-level KPI’s don’t break down into factory floor – There are many KPI dashboard systems that provide other KPIs to the C-level and Managers or that provide same KPIs to all workforce from C-level to shop-floor. This makes it difficult to resolve business transforming KPI issues at the factory floor, and to motivate the factory floor to routine profitable operation. Critical issue 2: Multiple management objectives create conflicts/profit loss – Previously, achievement of plant safety and the production plan was the main management objectives at the factory floor. Recently, new management objectives such as profitability, energy conservation, and asset reliability are added that causes further complexity or conflict and profit loss in plant operation. Critical issue 3: Decline of the number of engineers/operators who have the best practice to optimize relational KPI's – Engineers and Operators who started his/her career when the working plant was established and who know much about the commercial operation reach their retirement age. They understand which process variable is related to profitability, energy conservation or asset reliability, and know how to control it optimally within its ideal range based on an experience of trial-and-error. The best operators are disappearing from the industry and their knowledge needs to be captured and automated. Critical issue 4: Poor practice in leveraging high-quality big data from DCS to drive profit focus - The plant's distributed control system (DCS) interfaces with multiple equipment and systems and is a powerhouse of live big data that has seldom been leveraged by Operators for more profitable operation other than raw safety and system integrity purposes. Critical issue 5: Timely updating of models/parameters in automation systems – Linear program vectors in linear programming, rigorous models in process simulators, linear dynamic models in multi variable controllers, and PID parameters in PID controllers should be updated timely by Engineers to work to drive profitability. They rarely are updated at all or with relevant consistency. Such systems end up being ignored or switched off by Operators who simply need supplemental information on the DCS screen and in the same format. Traditional market approaches that help customers optimize profits in operations have been based on first principles approaches. This software-led approach has its drawbacks as it uses pre-built dynamic models to perform process optimization only and not profit optimization. While there are benefits in this approach, it is restrained in its capabilities to leverage best-in-class domain knowledge and industry bestpractices. These approaches do not build in the specific operational KPIs of the asset in question. The domain knowledge is critically important, as organizations look at solution providers to understand process nuances due to depletion of internal capabilities. This is where we differentiate ourselves – our ability to bring best-in-class technologies, domain knowledge and industry expertise to help our clients deliver on outcomes and profits. Yokogawa has more than 1,200 application experts and industry consultants who have a strong command of various process industry issues and can integrate a solution that drives sustainable value to customers. 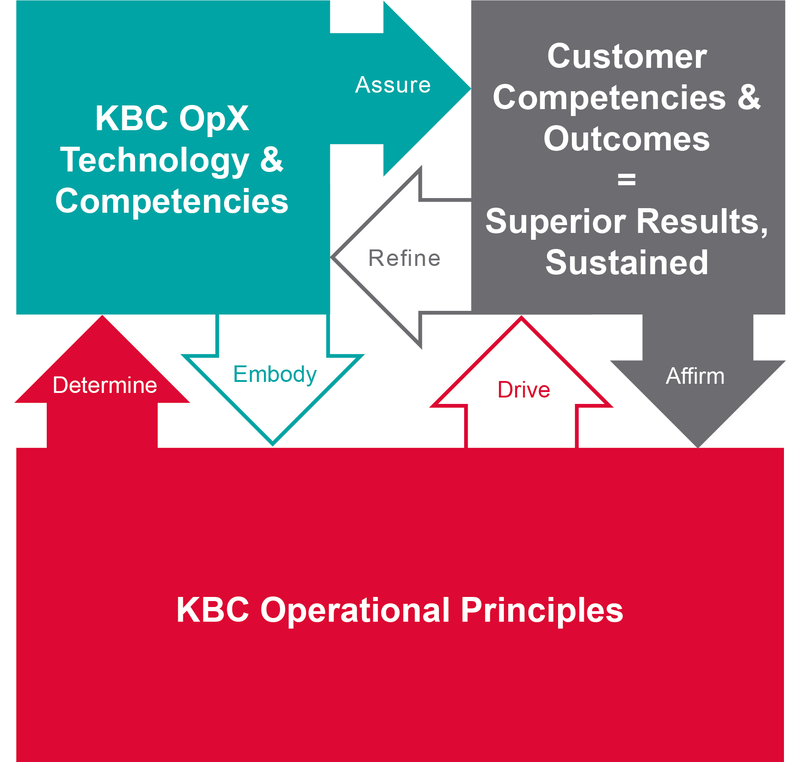 We leveraged KBC's best practices about hierarchical and role-based performance metrics that covers from C-level to shop-floor, and that motivate all employees to profitable operation for each role. KBC also has best practices around management objective-based performance metrics such as production achievement, profitability, energy conservation, asset reliability, and safety. The combination of Yokogawa's Operational and Information Technologies and KBC's best practices enable a client to visualize the balance of management objectives on a DCS-based dashboard, to notify abnormal situations, and to provide expert guidance that assists right decision-making and agile action for OpreX Profit-driven Operation. The combined synergies bought about by KBC and Yokogawa led to the creation of our new IA business concept - Synaptic Business Automation. This is structured to drive value across three areas –resilient operation, optimized production and business innovation. Additionally, the uniqueness of our platform is its ability to drive a symbiotic relationship between OT, IT and industry domain knowledge. Ultimately, these three aspects lead organizations to profitable and sustainable growth as shown in Exhibit 9. Synaptic Business Automation is Yokogawa's Industry Automation business strategy that serves as a platform for the company to work with its customers to sustain their creation of corporate value. Synaptic Business Automation creates sustainable value by connecting everything in our customers’ organization. To realize this, Yokogawa integrates its business and domain knowledge with digital automation technologies, and co-innovates with customers to drive their business process transformation. We believe that, digital transformation of an industry can be built on our robust foundational platform of Synaptic Business Automation. It helps customers achieve OT-IT integration, while leveraging core business and domain knowledge. The ability for customers to leverage our domain knowledge helps to nurture a symbiotic relationship between OT and IT and thereby achieve true digital transformation. As shown in Exhibit 10, OT covers operations management and control, while IT encapsulates business systems that help with sustainable value-creation. Our unique integrated performance management solution by integrating OT, IT and business & domain knowledge we have introduced is that of OpreX Profit-driven Operation. This solution is laser focused on sustaining and optimizing a plant’s profit performance. Our OpreX Profit-driven Operation solution leverages live big data from the DCS and combines it with domain knowledge to create role specific synaptic performance indicators (SPIs). We have identified hundreds of SPIs across the functions of operations, engineering and management. The SPI’s map back to critical performance measures such as production achievement, profitability, energy conservation, asset reliability and safety. While peers have focused more on improving profit in a siloed manner – we have a more balanced approach to help customers achieve OpreX Profit-driven Operation. Since the SPI’s vary by functions it is important to maintain sanctity between them, while at the same time facilitating a synergistic alignment to minimize conflicting SPI’s and waste. Exhibit 11 provides a view of SPIs. Today, we have developed over 800 SPIs for refinery operations and over 120 SPIs for ethylene operations. As we have developed the framework, methodology and own the underlying technology that supports this solution – it is very easy for us to scale and make this extensible across other application areas. The solution has already been optimized for oil refining and petrochemicals, and Yokogawa starts to quickly expand applications to energy and basic chemical plants. a. Production SPIs: This deals with gaps between production plan and actuals, yield and product quality. c. Reliability SPIs: Plant asset reliability, availability, mean time to repair (MTTR), mean time to failure (MTTF), mean time between failures (MTBF), running time and such others. d. Safety SPIs: It is a very critical part of plant operations as it covers emergency shutdown trigger points, plant shutdowns, total recordable incident rate (TRIR), alarm management. e. Profit SPIs: This is a composite score of all aforementioned SPIs, but computes measures such as gross margins, costs, process utilization and performance of automation systems. 1. Smart use of live big data from DCS: The DCS gathers a significant amount of data (like temperature, pressure, level, production, product quality, etc.) at a high frequency rate. The quality, fidelity and integrity of the data is very high. However, customers have traditionally used the DCS data for process monitoring, control and production management and not for optimization because traditional DCS doesn’t have the function of optimization or its assistance; although expert Operators knows that the DCS is a warehouse of valuable information. Most of today's operating models leverage data from plant information management systems (PIMS) to measure performance. For example, operations would look at measure of performances like control performance, process performance, critical alarm, etc., while engineering would look at yield, quality, energy consumption, and management would look at production cost, margin, energy cost, incidents, etc. There is a growing disconnect between the metrics of C-level, engineering and operations personnel. The challenge is in tying these function-specific KPI’s and mapping it back to plant-level KPI's like production, profitability, energy, reliability and safety. Further, we need to understand that – these plant-level KPI's (production, profitability, energy, reliability and safety) are tightly co-related. A negative impact on any one of these indicators may adversely affect the plant's profitability. Hence, the need to have a balanced outlook on plant KPI's is required to understand patterns, root causes for low performance and subsequently perform corrective and preventive actions. Yokogawa's OpreX Profit-driven Operation solution helps in structuring a seamless operation between C-level, engineering and operations using a SPI dashboard. Instead of a KPI, Yokogawa has termed its’ measure of performance as synaptic performance indicators, as it uses composite scores and applies domain knowledge on each SPI. 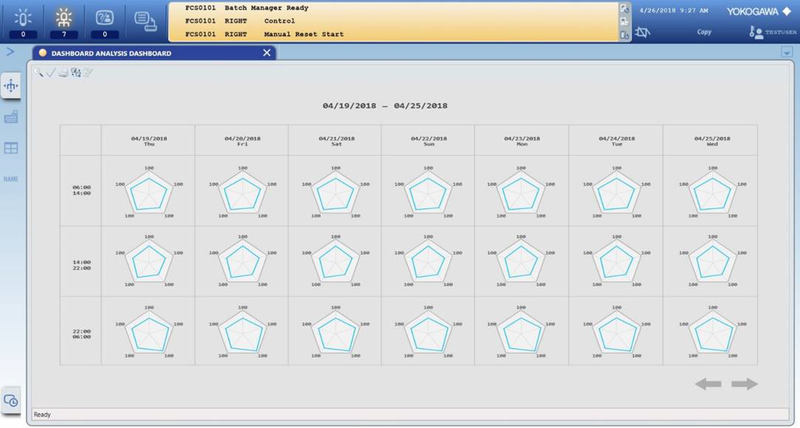 The dashboard pulls in live big data from DCS and remaining data from PIMS, and then computes it to a score in order to model good, balanced, cross-functional operational behavior. Even from a visualization standpoint, operators will be able to view one score to assess the health of the operations. As an analogy, Yokogawa's solution is similar to a personal health scorecard. It is just that, while most humans perform a health check-up once a year, Yokogawa's solution helps shift operators to view their performance/health in real-time. Similarly, engineering and management can see their data at the end of every shift/day. The ability to instill confidence and deliver intelligence in a byte-sized format is poised to immensely help shift operators and C-level management. Customers are also able to add/delete SPIs within their dashboards. This would ultimately help operations have an integrated view on the balance of priorities. Subsequently, organizations would be able to mitigate the trade-off between profitable operations, asset performance optimization, energy consumption and safety. 2. 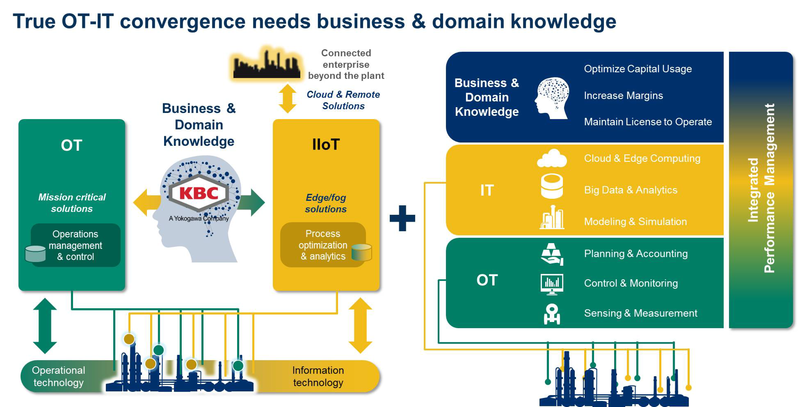 Integration of domain knowledge and creation of expert systems: Since our acquisition of KBC, Yokogawa has been distilling the domain knowledge and functional expertise and blending it across our OT portfolio. As a proof point, in the OpreX Profit-driven Operation solution – we have built in the consulting capability of KBC within this solution pack. The KBC's domain knowledge around process variables and ideal operating conditions are being astutely combined with DCS trend data. This has allowed us to position an ideal high range and an ideal low range. This will help shift operators to constantly compare and benchmark their performance against industry best-practices and peers. The integration of domain knowledge makes our solution an expert system, as it constantly trains and models good shift performance behavior. Using alarming and messaging functions in DCS, the dashboard also provides alarm message and expert advice when an SPI goes outside ideal range. 3. KBC Co-Pilot for engineering and management SPIs: While Operator use big data from DCS and visualize the data in their operator work stations, engineering and management-level SPIs are displayed in a cloud through KBC Co-Pilot. KBC Co-Pilot's differentiation is its ability to remotely distribute and support assets with domain expertise and insights supplementing internal capabilities and resources thus ensuring optimal utilization and performance. It is important to note that, engineering and management level SPI's can be hosted on-premise or hosted on Co-Pilot through a cloud infrastructure. The cloud infrastructure allows the functions of engineering and management to access, review and recommend actions anywhere, anytime. a. Reactive services: This assures the trueness of input data and ensures calibration of the model so that outputs are insightful. b. Monthly proactive services: Our consultants will deliver a monthly report that tracks goals performance and profits delivered. We supplement this data with recommendations and strategies to improve performance. c. Weekly proactive services: A report is generated every week to assess gaps in production plan achievement, issues and trends requiring maintenance planning. d. Daily proactive services: This is a full Co-Pilot offering, where our consultants assist operators with actionable recommendations based on live streaming data analytics. 5. Profit Improvement Program (PIP): Focused on maximizing revenues and minimizing costs, KBC's PIP consultants identify sustainable opportunities for profit improvement that require no or minor capital investment. By applying rigor to our analysis through use of accurate and reliable process models, depending on plant size, a typical PIP from KBC can deliver measurable benefits of more than $10-100 million (A typical 200k bpd refinery). Energy savings or carbon reductions of 3-10% can be expected, and where energy systems are constraining process performance, 1-3% increases in throughput or yield can be achieved. Synergy between process and energy leads to benefits far greater than considering these two factors in isolation. Exhibit 12 shows an example of a SPI dashboard. Please note that, the chart on the right hand shows a SPI dashboard with expert advice – wherein KBC best-practice recommendations are built in to ensure a balanced plant operation. KBC technologies and domain knowledge helps in creation of an expert system in place. As part of the solution launch, Yokogawa is releasing a new performance dashboard and related services that are integrated into existing CENTUMTM distributed control systems (DCS) to enable plant operators to monitor in real-time how their operation patterns are impacting high-level plant management objectives. When the service is implemented at a plant, optimal setpoint ranges are determined for each SPI, and then if a certain indicator moves outside the ideal range, built-in expert advice is displayed to support prompt action by even inexperienced operators. This expert system will automatically alert/alarm operators if the indicator value is below the threshold parameters. The SPIs and operator performance are automatically accumulated by shift to enable internal and industry benchmarking, root cause analysis, and expert consulting for continuous profitability gains. Further, KBC consultants step in and provide recommendations/insights on how best to bring the process back under normal operational parameters. This is a key example of how we drive expertise-as-a-service for our global customers. Due to conflicting priorities and SPI's, it is important for an Operator to always be in the know on what happens if a parameter changes and how it would affect the overall system performance and associates SPI's. To solve this issue – we came up with a Japanese karaoke styled dashboard for balanced scorecard of plant management, which updates in real-time using live big data from DCS. Karaoke-Type Historian makes it possible to understand the differences in management objectives on the each unit of operational shift, and to analyze their balance. In the previous chapter, we looked at the solution value and differentiated approach of our OpreX Profit-driven Operation. In this chapter we will discuss the salient aspects of the solutions’ technology enablers that create sustained value by utilizing plant data with domain knowledge. We have outlined the key technologies in Exhibit 14, and mapped it back to specific plant domains for easy reference. A common thread across these technologies areas is that every aforementioned solution has built-in elements of OT, IT and industry best-practices. We firmly believe that digitization and digitalization is not only about system integration but also about technology differentiation. This is one of the reasons why we have structured our technologies to create applications that can scale based on size and requirements. As you see in Exhibit 14 – we can easily scale the technology applications and solutions from sites to an enterprise. This is our continued vision to help our customers seamlessly move from Stage 1 of digitization to Stage 2 of digitalization and onwards to Stage 3 of Enterprise Digital Transformation. −DTSX / Distributed temperature sensing: This is an optical fiber sensor that measures the temperature distribution along a long-distance fiber-optic cable. It measures with high accuracy and unlike traditional measuring technologies – this is not impacted by electromagnetic noise. Our innovative capability and technology ingenuity led to the development of an industry-leading distributed fiber optic sensing solution. It provides thousands temperature measurement points in minutes which is ideal for well monitoring, pipeline leak detection, fire detection, power cable monitoring, or other large production facilities. Thus improves operational safety, availability and efficiency. This solution currently includes two main products - DTSX200 and DTSX3000. The differentiation is its integrated industrial modular design with longest distance, up to 50 km and highest performance. Such capabilities are beneficial to facilitate reliable measurement in harsh environment which was never realized in the past. Oil and Gas, and other customers continue to adopt these cutting-edge distributed fiber optic sensing solutions in various applications. −Smart sensor and soft sensor: The proliferation of sensors to collect data is expected to grow significantly, as the thirst for converting meaningful data → insights is present across process industries. At the same time, these instruments need to be calibrated in order to manage the integrity of data captured. Realizing this need, Yokogawa developed a product called as SENCOM (SENsor with COMmunication). The package includes a pH ORP sensing module tha t interfaces with management software SPS24. The electric circuit placed within the sensor pack allows it to complete the measurement itself and transmit the measured values in form of a digital data. As we introduced newer models (FU24F for pressure fluctuation and SC25F – for under high pressure circumstance measurements for use in chemicals industry), we are looking to minimize the product footprint. As a case in point – the number of components on the sensor chip has been reduced to 1/3rd of the prior model to help with miniaturization and power consumption. This has also helped with the smaller footprint, as the mounting area was reduced to 1/6th of the size. Some of the application areas have been mainly in liquid analysis. 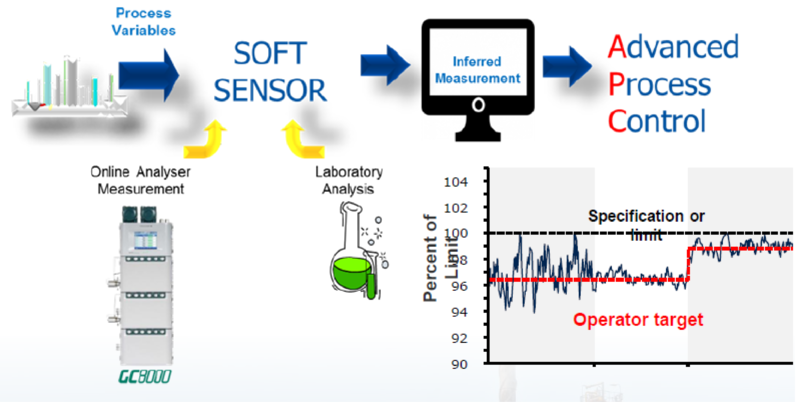 Yokogawa's soft sensors use inferential property estimation to drive more stability and process control. The software, in conjunction with Advance Process Control (APC), uses multivariate analysis and product properties in real-time. The ability to deliver non-linear process improvements will help customers have a clear view of the product quality in real time. Exhibit 16 shows a use-case, wherein our soft sensors work in conjunction with a gas chromatograph and APC software. − Like an aircraft Co-Pilot, KBC Co-Pilot supports remotely the plant's operational personnel with expertise and insight. The solution’s main objective is to ensure that the plant always achieves its full operational potential. Yokogawa uses a best-in-class simulator and plant-operating model on the cloud to synchronize with actual operation. The ability to extract real-time plant data helps to compare planned value, optimized value, and actual value in real time. Further, with the support of KBC consultants and experts who have diversified knowledge, customers can achieve optimized processes, higher value yields, improved plant reliability, and optimized operating costs. Yokogawa has implemented such solutions in the refining industry and plans to extend them to the upstream, petrochemicals and chemicals industries. On an average, Co-Pilot has yielded savings anywhere from $3M to $10M/year. The extensibility of this solution into critical plant applications shows our ability to go deep and wide, while cr eating lasting value for our customers. − Petro-SIM: This is one of our best-in-class solutions that cuts across the upstream, refinery and petrochemical value-chain. It is a process simulator that can model the entire refinery from crude to final product blending. Also, as its part of KBC – customers have access to a large database of process models (FPSO, LNG terminal Cogen, Combined cycle LNG plant, Ethylene cracker, Furnaces, etc.). Our ability to leverage Petro-SIM in areas such as heat exchanger fouling monitoring and cleaning optimization shows our capabilities to identify critical applications and develop solutions for the same. Frost & Sullivan states that, heat exchanger failures account for nearly 30% of unplanned downtimes across end-users (oil and gas, power, nuclear, refining). Today, most of the inspection on heat exchangers are done during plant shutdowns or are reactive. Our solution helps in digitizing the da ta collection and digitalizing the maintenance process of heat exchangers using asset-specific predictive data models. Further, our solution can also help customers in designing new heat exchangers, by automating geometry designs. In 2016, we developed a pilot of this solution with our customers in Japan. At the end of the trial, we were able to confirm that it is possible to build an anomaly score from the data captured. Using a machine learning algorithm, the entire process of data capture to anomaly detection was digitized and digitalized. Compared to traditional processes of paper-based monitoring, skill based monitoring, statistical process control analysis and siloed data capturing, this solution should be seen as a first step in leveraging technology to drive predictability in asset operations and management. e-RT3 Plus is also another good example of our design philosophies. This product incorporates OT, IT and industry best-practices to shape outcomes that are optimal and profitable for plant operations. As we scale on these solutions, we will be able to train our algorithms on other equipment diagnostics and allow it to uncover hidden rules and anomalies almost automatically. While the market has seen the democratization of analytics, very few can seldom be applied on plant data, due to its unique characteristics. Even though plant failure data accounts for only 0.05% of the overall available data – our process knowledge and domain expertise helps us to customize the delivery to our customers. Exhibit 18 shows the ability of a machine learning algorithm to identify anomalies from streaming sensor data. −Process data analytics using Mahalanobis Taguchi (MT) method: This deals with product quality and traceability issues. We have applied this in chemicals industries to help our customers trace back raw material, product genealogy and help deliver consistent product quality immaterial of the raw material composition. −Data driven Modeling: We are striving to utilize RENKEI (A Japanese co-operative concept to achieve effective use of plant energies) and achieve the best balance between operation cost and product quality. In order to achieve this, significant knowledge around physics, thermodynamics, operation plans, optimization calculations, chemical engineering is required to achieve the optimal balance. Since there is a broad shortage of skills, timing and focus – we developed a data-driven model for optimization (DDMO) that can automatically create equipment models from actual plant operation data. The DDMO technology uses multiple statistical analysis methods to extract not only output characteristics but also relations between the various variables of the equipment. This is converted into mathematical equations and ported into optimization software for further analysis. The DDMO uncovers underlying relations and also estimates the coefficients of characteristics equations. This means that, customers don't have to be statistical experts or mathematicians. Some of the applications where we have applied this are energy savings, cost optimization in pulp and paper processes. Our solution can help you save more than 80% in man hours to build reliable plant and equipment models. Further, DDMO can help with total optimization of processes that comprise several unit-level processes. This is currently being piloted in Japan and will extend its use in environmental/sewage treatment applications. −DDMOnEX – an operation support service solution: Keeping with market trend on expertise-as-aservice, Yokogawa Solution Service Corporation has created this unique solution service offering to help customers balance cost, quality and efficiency. A recent adoption at a Japanese pulp and paper facility (with a production capacity of 1,820 tons/day of wood pulp) helped it to balance energy use, consumption and product quality. Further, this is an outcome-based agreement – wherein we deliver outcomes and collaborate seamlessly with plant personnel through our GRANDSIGHT value-creation solution. This solution helps us to perform video conferences, share schedules, store data, transfer knowledge, do project management and develop application software based on needs. Yokogawa conducted a simulation using the plant model to search for the operation balance. Yokogawa provides necessary services step by step while quantitatively confirming the effect of optimization operation using the model co-created with our customers. We are continuing to make progress by striving to solve problems that are beyond human intelligence, using AI/ML. 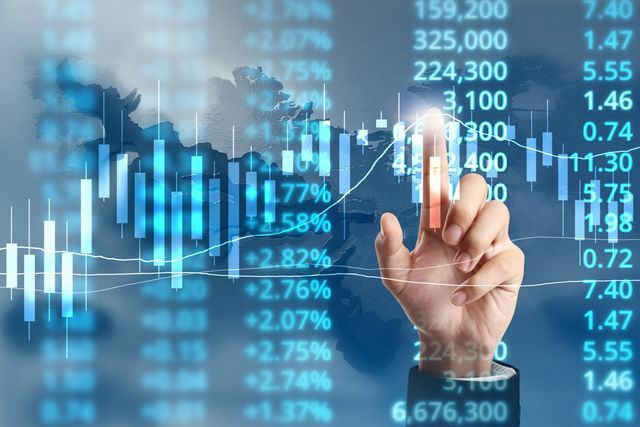 In our opinion, the industry has just started its journey in plant performance optimization using analytics and there is much to be discovered. We are also testing out new business models like profit-sharing contracts, wherein we get monetized based on quality of outputs delivered to you. This is being tested out in our aforementioned DDMOnEX solution. With our rich expertise and market track record, we have developed algorithms to solve customer issues around precise future forecasts of failure, root cause analysis of problems, early prediction of the final product quality and automated monitoring and analysis of streaming sensor data. In our quest to continuously improve our AI/ML capability – we are also utilizing Deep Learning technology in the field of imaging analysis through detailed application. This is being piloted in certain areas to help customers automate their work processes and ultimately maximize operational efficiency. • Domain knowledge for AI algorithm development: Our status as one of the largest independent pure-play automation solution providers and laser focus on process industries has allowed us to retain deep domain knowledge. This is a key requirement, as domain knowledge translates into better AI algorithms. Further, it is also required to best interpret the results provided by the algorithm. • Co-innovation and co-creation culture: Algorithms see only data and provide data. It is ‘humans in the loop’ that bring in the knowledge around physical settings, interactions and such others. • Capability of one-stop shop realization with AI systems: System integration is the single biggest challenge within process industries. Frost & Sullivan states that, roughly 2/3rd of an enterprises plants are brownfield (More than 25 years in age) and 1/3rd are greenfield plants (that are <15 years of age) across process industries. Thereby, when applying modern technologies on legacy assets, knowledge around best-practices in system integration is critically important. We bring not only system integration capabilities but also best-in-class domain knowledge to help our customers realize value. • Leverage OT-based data analytics to solve customer issues: Unlike IT solutions which apply analytics from a top-down manner, we use our domain knowledge to convert knowledge into wisdom. We are able to improve reliability by reducing human errors through predictions in operations and publishing alerts in an automated manner. Our analytics capability is also able to analyze data across the whole supply-chain and optimize the relationship across multiple supplychains. In summary, our ground-up view of enhancing operational intelligence is credibly differentiated and built on core domain and industry knowledge. In order to understand the usability and success of OpreX Profit-driven Operation solution, we will look at a few customer success stories that Yokogawa has experienced across the industry. #1 - Process Data Analytics, identifying silent change issues through analytics: Utilizes OT, IT, Business and Domain Knowledge. Challenge: The chemicals value-chain is highly connected. Hence, if an issue occurs in one-part of the value-chain, it has a ripple effect. Even though great caution is exercised to ensure precise processing – the company discovered that there was a need to monitor process deviations more closely to reduce variability in the end-products. Due to the variability in the supplier sourcing ecosystem, the company was unable to pin point the source of the issue and was unable to achieve its quality related KPI’s. Solution: Yokogawa began offering a process data analytical service to its customers in 2008. To date, more than 100 contracts for this service have been concluded with companies in Japan's chemical industry and other industry sectors. The companies have begun to rely on this value-adding service. We leveraged the Mahalanobis-Taguchi System (MTS) to design and develop a multivariate measurement system to accurately measure the level of pattern abnormality and subsequently evaluate the accuracy of predictions. The software solution, packaged as process data analytics, compares the collected data and triggers an alarm based on any process deviations. Outcome: Immaterial of the raw material supplier, the customer could achieve uniform end-product quality while proactively managing issues in real-time due to early visibility. Further, quality inspection teams could scale this solution across all sites and tighten control procedures. By scaling the solution – the customer was able to achieve predictability in profits and optimize their processes. #2 – Improving 1,3-Butadiene process control: Utilizes OT, Business and Domain Knowledge. Chemical industries face acute issues in leveraging critical process analytical instrument classes to drive predictability in operations and product quality. There are multiple variables that needs to be balanced, while predicting process behavior. The lack of adequate sampling system and heavy non-linear processes further compounds to the problem. This results in out-of-bounds specification limits and varying product quality output. Challenge: Process variability swings created a divide to achieve maximum product yield at minimum steam consumption levels. The operator target also has to be near-specification levels always. This requires a careful calibration of processes and parameters. Solution: Yokogawa’s APC solutions astutely used GC8000 (online analyzer measurement) along with lab variables and a smart/soft sensor to drive optimized process control. The soft sensor is unique in its applications, as it monitors non-linear process applications, while providing a clear view of product quality in real-time. Outcome: Our customer was able to improve process efficiency, decrease material loss and optimize the amount of steam required to run the process. Ultimately, the use of our solutions resulted in a net improvement of 3% yield increase in Butadiene production (or) a $3.5M savings/year. The future of process industries is digital, flexible and predictive with zero downtime. The aforementioned principles will usher the various customer segments to think differently and continue to challenge their present-day operational model. As technology refresh cycles has halved, customers are clearly unable to keep up with the pace and often confounded by the rapid pace of change. Many process industry’s CEO’s have created a joint task force around digital transformation in order to maintain a competitive edge and help it drive overall profitability. As the industry downturn is seeing recovery – We have observed a shift in the customer spending behavior. They see Fortune 500 and large operating companies spend money to save money and drive positive shareholder returns. The penchant to do more with less is more pronounced today, but the vision is severely challenged by the decline in skilled workforce and the requirements of radically new skillsets. This brings us to a juncture, wherein industries must react in a sustainable manner to stave-off the forces of disruption. One of the best-practices resonant with the industry is the recent willingness and openness to co-create solutions to help them solve internal challenges. This is a marked shift in companies, as every activity was predominantly performed in-house. The co-creation trend has seen an emergence of long-term partnerships between process industry customers and automation solution providers. In essence, as customers transform in their journey – we are also continually evolving from being a technology-centric company to a trusted automation solutions and profit-enabling company for our customers. We are revamping our solution portfolio to incorporate OT, IT and domain knowledge in every product. The infusion of intelligence and expert knowledge at a system level is poised to help plant’s run smoothly and in a self-healing manner. As predictability in operations improve continually, there will be a stage wherein plants will experience zero downtime due to remote monitoring and predictive performance optimization. Technologies would instill a new level of confidence and drive digital transformation across a customer’s value-stream. This will also help customers perceive unexpected value and benefits. As digital transformation ensues to disrupt, transform and re-shape industries – the imperative to change for process industries is clear and very present. Customers will need to shift their focus from reactive operations to proactive, predictive and profit optimizing operations. In order to achieve this stage of maturity, data and data quality is important and the consistent use of it from the Operating Room to the Board Room. The ability to extract the right data to drive value creation will set companies apart in the future. Customers who leverage data as a critical asset will maintain a competitive advantage. The automation of data → knowledge → insights is an area of focus in the immediate future. In order to get to this stage of maturity, we find that majority of the organizations are significantly unprepared to be datadriven. Often, customers replace existing big data technologies and the culture has not yet transformed to leverage data as a critical digital asset. Some of the other critical issues in transforming an organization to become data-driven include organizational alignment on analytics, overcoming existing master data issues, recruit new talent (data scientists, machine learning experts) and best-in-class data governance practices. 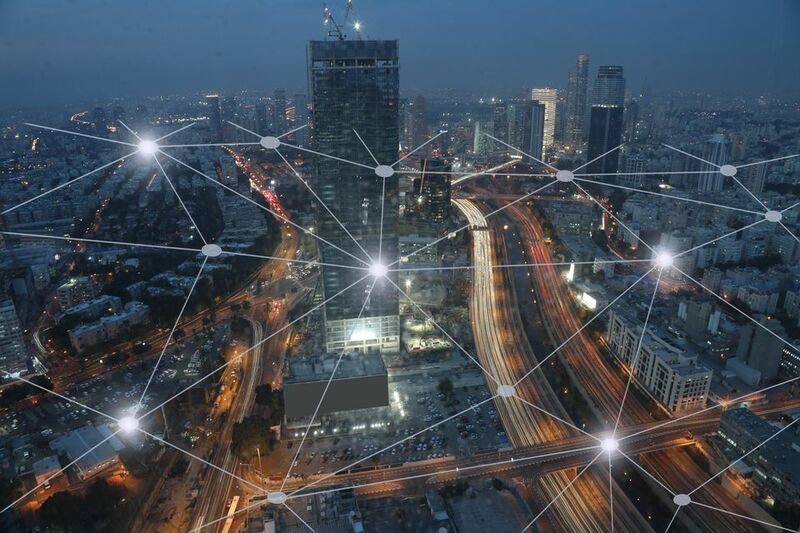 In essence, organizations should leverage data as a pathway to drive operational efficiency, growth and sustained operational value improvements. While there are many solution providers in this market offering piece-meal offerings, customers prefer an integrated solution offering and a trusted partner approach. As data complexity differs for each company, the imperative is to co-create solutions that fit the needs, requirements and budgets of customers. The journey to reach this future state of OpreXTM Profit-driven Operation is not easy and is filled with challenges, but Yokogawa’s solution portfolio and continuous innovation can lead you to become a world class performer and that performance is sustained.